Looking to see a new movie to make you giggle in the next couple of weeks? Well, from the director of The Hangover, Old School, Road Trip and Starsky & Hutch comes Todd Phillips new release Due Date. 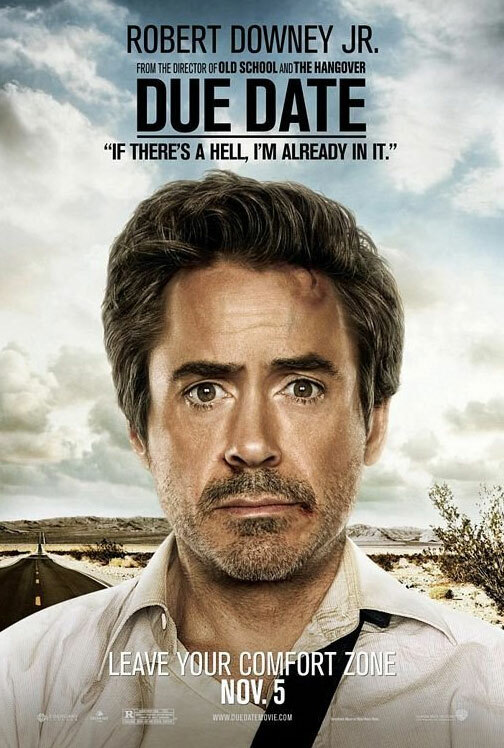 Due date stars Robert Downey Jr., Zach Galifianakis, Michelle Monahhan and Jamie Fox, and is released in the UK on the 5th November 2010. Peter Highman (Robert Downey Jr.) is an expectant first-time father whose wife’s due date is a mere five days away. As Peter hurries to catch a flight home from Atlanta to be at her side for the birth, his best intentions go completely awry when a chance encounter with aspiring actor Ethan Tremblay (Zach Galifianakis) forces Peter to hitch a ride with Ethan-on what turns out to be a cross-country road trip that will ultimately destroy several cars, numerous friendships and Peter’s last nerve. We’ve studied, the Due Date trailer (see below) and taken a look at the gallery of movie stills to give you an idea of the eye wear we’re going to see in this comedy movie. Robert wears a pair of cool looking Benedict aviator style sunglasses by Oliver Peoples. Zach wears several unidentifiable pairs in Due Date, while the top two images are likely to feature a pair of designer branded sunglasses the bottom two images look like they are a cheap pair you would normally find in your nearest petrol station! Zach wears military issue Birth-Control Glasses (BCG). They are the cheap and typical frames issued by the military to soldiers who need them. They are called birth control glasses because they are very unattractive when used as prescription glasses, thus supposedly drastically decreasing the likelihood the wearer will lay with a woman. for more info, check out the wikipedia article.